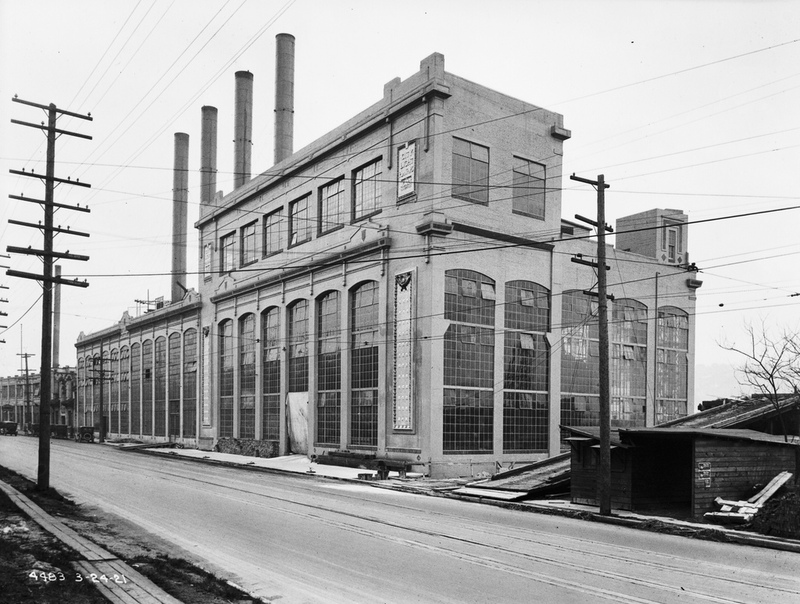 I was talking to some soon-to-be Eastlake residents the other night and realized that they (and, I presume, others) didn’t know the history of the Lake Union Steam Plant. Indeed, they didn’t even know that the ZymoGenetic’s building had been a power plant in its past life. That evening, I happened upon the Flickr stream for the Seattle Municipal Archives. And there was a photo of the plant taken in the 1920s (right). There was apparently some construction work under way at the time (note the wood covering an entrance). A quick trip to HistoryLink.org found an entry on the history of the steam plant that is part of a cyber tour of Lake Union. The original Power House is the small building on the south with a red roof. Over the years, the plant was expanded in three phases. Originally intended to produce power for peak loads, it eventually ended up generating electricity for base loads. In the mid-1980s it was shut down (I saw it in operation exactly once). The original plan was to convert the steam plant to condominiums, but that fell through. ZymoGenetics bought the building in 1993 for $1.6 million and, according to HistoryLink, spent 20 times that much renovating it. It was accorded historic preservation status in 1994. The plant’s seven original smokestacks were in bad shape and were removed in 1991. Six replacement stacks were installed during the renovation in 1994 (federal standards, HistoryLink says, discourage exact replicas). In the meantime, new condos had sprouted on the western slope of Capitol Hill. Condo owners had grown accustomed to the view unemcumbered by smokestacks. When the replacement stacks were installed, residents of those condos screamed to the Seattle Times that their views were being destroyed. Another photo of the plant, this one from the Seattle P-I archives from 1937, is available on King County Snapshots. A piece of one of the original smokestacks will soon become a permanent part of the Eastlake landscape. We’ll let you know when. Thanks to the Seattle Municipal Archives for use of the photo. This entry was posted in Uncategorized on July 8, 2009 by cdmilton. I have always thought the fake smokestacks are the most ridiculous thing ever built in Seattle. The real historic view is of the trees on steep slope of Capitol Hill. Will we never be able to remove this memorial to pollution? I started out opposed to restoring the smokestacks, but was convinced otherwise during that debate. Without the stacks, the Steam Plant is less historic, and more just a quirky adaptive re-use. The history of the Lake Union Steam Plant was a centerpiece of the unsuccessful corporate effort to crush the birth of public electrical utilities. The January 13th 1985 last firing of the Steam Plant is an appropriate benchmark for the end of Lake Union as a “working lake”. So, from both national and local perspectives, the Lake Union smokestacks are important and are — by every definition — a landmark.